Oysters, lobsters, crab, langoustines, clams, mussels, monkfish, scallops, sole, salmon, trout... a truly outstanding selection of the purest, freshest, most nutritious and delectable seafood. After we were turned away at the Harbour View and another restaurant, whose name I've forgotten, we ended up at the Restaurant @ the Rosedale, where we shared a seafood platter for two, which was quite tasty and which we cleaned in a very short time and licked the platter, too. Check out the gull in flight that I caught in the picture of the Rosedale. The crowning dining moment came when we dined at The Three Chimneys Restaurant, pictured at the head of the post, in the back of beyond "on the shores of Loch Donvegan" on the Isle of Skye. Cathy knew about the restaurant from an earlier visit to Scotland, but she'd missed out on having a meal there, so she was determined not to miss again. In fact, Cathy was so determined that she made the reservation for our meal a good while before we left for our travels. 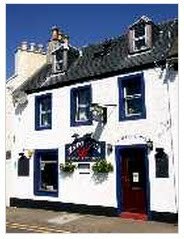 Ever since eating outstanding Scottish seafood at the Western Isles B&B in Mallaig on the Isle of Mull and then eating langoustines that I would kill for, from the water right into the pot, at the Glenuig Inn in Arisaig, I gorged on les fruits de mer for most of the rest of the trip. I'm from south Louisiana, and I'm quite accustomed to excellent, fresh seafood, so for me to praise Scotland for its seafood is a compliment beyond measure. By the time we went to The Three Chimneys, my fingers were so scratched and cut from grappling with shellfish that I knew I had to give them a rest and time to heal, so I chose venison for my entrée. I don't remember what Cathy ordered. In the midst of a dining experience like that offered at The Three Chimneys, who cares what others are eating unless you want a taste? I went at the food with gusto, my readers, as did my travel companion. It's refreshing to dine with another woman who appreciates good food and enjoys it without constant worry about calories. Time enough for that when the holiday is over. For dessert we both chose the "Dark Chocolate Ganache with Blairgowrie Raspberries & Issy’s Crème Fraîche", which came in two courses, which confused me a little. First came the palate cleanser, the berries and cream and then the dark chocolate ganache. I express my profound gratitude to Cathy for insisting that we have a meal at the restaurant. Without a GPS, I can't imagine how anyone finds their way to the place. One day, I'd like to spend a few days in one of the "6 spacious bedrooms next door in The House Over-By", but I expect that will never happen. But then, I thought the trip to the Northwest of Scotland would never happen. 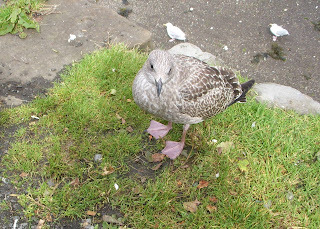 A sea gull with pink feet at the harbor in Portree. And MadChauffeur told us the Isle of Skye was boring! We now know that he is not infallible. We had damn good fish and chips in Portree too - that's worth mentioning. 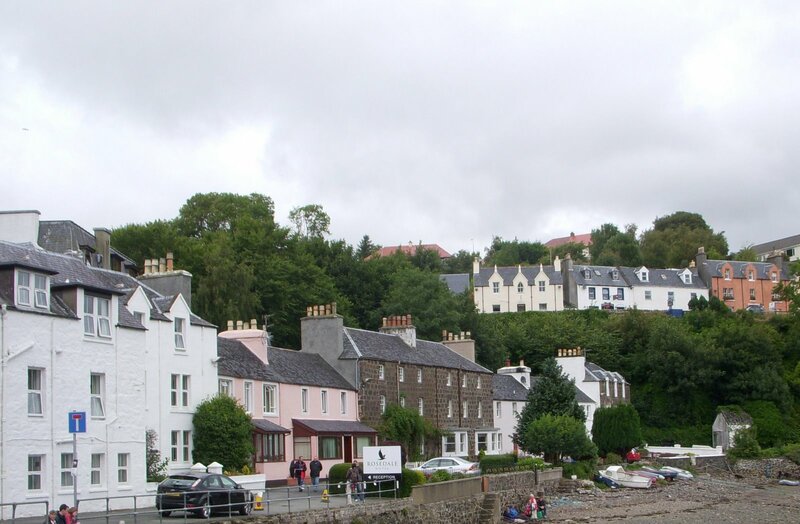 (And in Mull, but that's maybe another story?) It took a while to get it at that place at the top of the hill in Portree, only because there was such a long queue though, but when it finally arrived it was everything fish and chips should be. Well, he's not the bloody pope, is he? Though he does pontificate on occasions. Thanks for regaling us with culinary adventures. We do enjoy "traveling" with you. "Cheese as an Extra Course is Charged at £15.00"
Lapin, you should envy. We did not order the Extra Course Cheese at £15.00. No, Paul, MadChauffeur is not the bloody pope. I don't have to do as he bids any longer. I wish all y'all could have been along. What a gay party we would have been. With all those racy reports and single malt it sounded gayer than I expected. Thoroughly enjoy your travel accounts! Whiteycat, thanks. This post took me hours, what with all the links and searching for pictures of the restaurants. For some reason, photos of restaurants are sometimes scarce. I wish I could remember to take pictures of the places I plan to write about, for I'd save a good deal of time. Oh, it does so sound wonderful! JCF, my mouth watered as I wrote. The langoustines! That's the first time I'd ever eaten them. Delicious beyond description. Ciss, the trip was lovely, a dream come true. You and Cathy are real "foodies" ... people after my own heart! My husband and I went to Skye on our honeymoon 20-something years ago, a side trip recommended by our golf partner in Nairn. We thought it was just about the most magical place on earth. 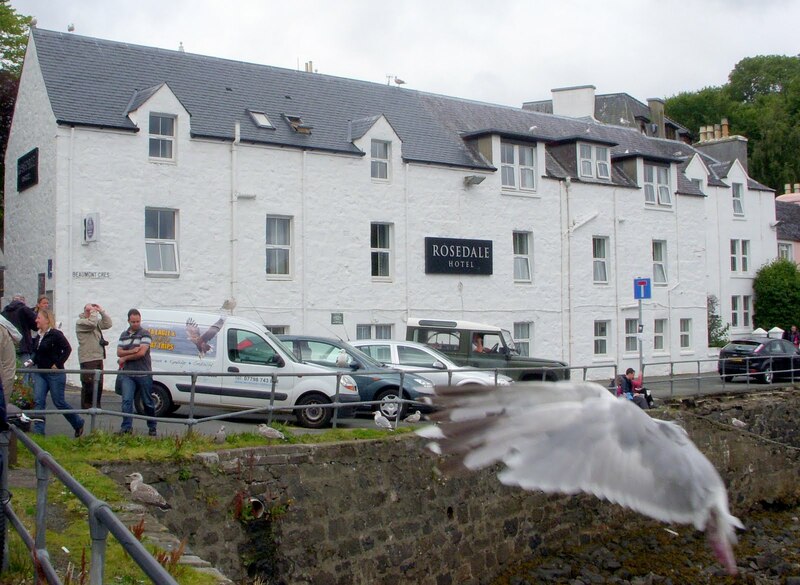 I particularly remember a meal of North Sea prawns, huge things they were, at the Ullinish Lodge near Struan. The setting was beautiful, the sky was misty on the mountains in the distance, and it was like dying and going to heaven biting into those prawns. Glad you liked your visit there, too! Life would not be dull if Mad Priest was the bloody Pope. At Three Chimneys I ate Skye Lochs "Fruits de Mer" (langoustines, crab & oysters) & the roast saddle of venison, both of which were utterly delicious. The venison was sensationally tender and I bought a glass of whatever red it was that Mimi was drinking to go with it. I can't remember what it was called but it went down very well. The first dessert we got served was not actually a palate cleanser, I think - just a treat to make the customers feel looked after, a little pot of frozen berries with hot white chocolate sauce. It also was absolutely gorgeous. I wish everyone on here could have come along as well. That would have been a hoot and, as Mimi points out, a gay party. Penelope, you make my mouth water for prawns from Ullinish Lodge. Skye was magical in every way, except for the midges. I could well have done without the midges. Cathy, I believe the wine was Italian, but I can't remember what kind. I'd had it before and liked it, and I recognized the name on the wine menu. I stand corrected on the palate cleanser. You know about those things. I'd never had a two course dessert before. Wouldn't a group of us be a gay party? We'd rock the island, and it would never be the same. That gull in flight is a fabulous pic. I tried loads of times to catch birdies in flight in Scotland and I think I only succeeded the once, and at long distance. I'd love to stay at Three Chimneys too, but it's very expensive. Its rooms look fabulous though. And you could eat there every night! Maybe one day. Whiteycat, Cathy and I are both foodies. I ate sticky pudding for the first time while I was there. MadChauffeur gave me a taste of his, and thereafter, I ordered the dessert twice. 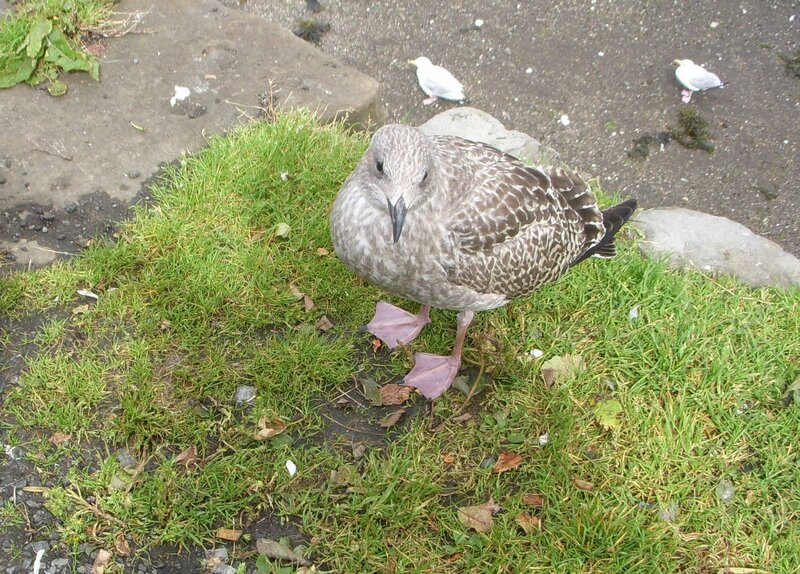 Cathy, the picture of the gull was pure accident. I believe I like the out-of-focus effect better than if the dove was in focus. The bird looks sort of ethereal. The restaurant we got turned away from when we ate at the Rosedale was the Sea Breezes, down on the harbour. It's quite a little place and doesn't seem to have much of a presence online. Cathy, I meant to mention the yummy fish and chips in Portree, but I forgot. That was a long queue that you stood in to get ours, for which I'm quite grateful, because the meal was delicious. Sticky toffee pudding is pretty simple to make. Try it. Linked recipe selected for its US measurements. Lapin, thanks for the recipe for sticky toffee pudding. It doesn't seem difficult at all. Sticky toffee pudding was allegedly invented at Sharrow Bay Hotel in the Lake District in 1960 or thereabouts. However as with all of these things there are a few people round the UK who say they came up with it. Anyway who cares, it's totally delicious, especially in the winter when a nice heavy sticky caramelly dessert pushes all the right buttons. I've found it very popular with Southeners. The Sharrow Bay claim seems to be accurate. It's actually a very odd recipe, but it really works.